This week’s guest post was contributed by Junior League of Oklahoma City sustainer, Elizabeth Richardson. Hooray! Fall is finally here! Time to get your front entry and outdoor planters looking festive for the season. 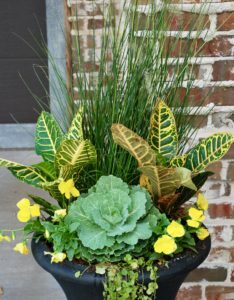 I’m excited to share container gardening tips to ensure eye-catching curb appeal for your home or business. Thanks for reading alongirst, the basics of container garden design. I use a super simple design concept in all my outdoor pots – thriller, filler and spiller. I start with picking out the thriller. The thriller is the one tall plant in the container that gives the arrangement height. Next, I pick out the fillers. The fillers fill in around the middle of the pot. Lastly, I select the spillers. These beauties cascade over the edges of the pot. It’s so easy…thriller, filler, spiller! So, what are my favorite thrillers, fillers and spillers for fall planters? Colorful crotons and ornamental grasses are my thrillers of choice. Next comes the fillers, which fill in around the middle of the planter. My favorite fillers for fall are pansies, cabbage, kale and pumpkins. What? Pumpkins? You bet! Just pop some pie pumpkins or mini-pumpkins right into the pot. So festive! Lastly, comes the spiller, which cascades over the sides of the planter. My go-to spiller for fall is bright green moneywort (aka creeping jenny). In the picture, I’ve used an ornamental grass as the thriller. I have lots of fillers going on here – two crotons, a cabbage and yellow pansies. Moneywort finishes out the design as the spiller. Doesn’t it look festive for fall? I have plenty of other examples of fall planters on my website, www.adornokc.com, or you can follow Adorn on facebook or instagram for pictures and videos posted daily. I could talk about container gardening and creating curb appeal all day long. If you are involved in a garden club, or have an upcoming team building or girls night out event, I’d love to be a guest speaker on all things curb appeal and container gardening! From a formal presentation to a hands-on, get your hands dirty workshop where you create and plant your own container. Give me a shout at 405-255-1730 or Elizabeth@adornokc.com and we can get something scheduled. Cheers to fall and fabulous curb appeal!